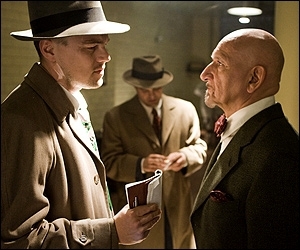 The tried and tested duo of Scorsese and DiCaprio team up once again for Shutter Island, a psychological thriller based off the novel by the same name, written by Dennis Lehane. Unfortunately, what was one of my most highly anticipated films of 2010 ends up falling somewhat flat in a number of areas. The original "movie brat" Scorsese has been around for decades weaving layered classics with a special attention to detail and filmmaking technique that characterises a true film geek. His latest film sees him channeling the late great Alfred Hitchcock, sometimes overtly with scenes that are strongly reminiscent of the likes of Psycho and North by Northwest. Be forewarned, there will probably be spoilers, as it is quite hard to comment on what the film does right and wrong without discussing the narrative. Now this is first and foremost a movie of atmosphere. An ominous and brooding film noire laced with the hallmarks of the great psychological thrillers past, and topped with a bold and confident production team that clearly knows how to draw you into the moment and make you feel uneasy even during the most placid of scenes. The story overlooks a 1950s postwar era, with US Marshall Teddy Daniels (DiCaprio) investigating the disappearance of an inmate from the insane asylum located on the isolated, so creepy it could only have been designed for a B-movie, Shutter Island. The plot thickens as Daniels and his partner begin to uncover details of the controversial treatment methods used by Dr. Crawley (Kingsley) who has set himself up as the apparent ruler of his foreboding island fortress. Almost from the get go we are led to expect your standard 'immoral doctors experimenting on patients' B-movie plot. But in classic Hitchcockian style, things are rarely as they seem. Even early on there is no doubt that the real story here lies within the mind of Daniels, a man haunted by his traumatic experiences in the war and the death of his wife. He suspects that the man responsible for his wife's death is present in the asylum, and investigates further. But as his journey meanders forward he is increasingly plagued by confusing visions, are they hallucinations? Memories? By the time the film reaches its climax, Scorsese has artfully eroded away at our preconceptions, slowly loosening our grasp of what is real, presenting a reality that contradicts itself, leaving us 2 and a half hours into the movie and thoroughly confused. Then in one climactic scene he springs a twist upon us that attempts to completely make sense of everything. Now this twist, which I won't describe here, is certainly a bold one, if slightly contrived, and the end of this scene does lead to a flashback sequence from Daniels' earlier life that has to go down as one of the most darkly haunting scenes I've watched in a while. But ultimately it feels forced, it's an ending that requires us to simply disregard much of the backstory that the early portions of the film spend so much time telling us about, and requires us to accept that pretty much everyone in the movie, doctors, Daniels' partner, everyone was 'in' on it from the start, which may sound like a compelling twist on paper, but when held up to scrutiny it simply doesn't add up and takes a huge suspension of disbelief. The big reveal is also just clumsily handled, the equivalent of a cinematic sledgehammer, not exactly awash with nuance. Technically speaking, there is very little to complain about in this film. The directing is of an unsurprisingly high quality, but almost feels too 'textbook', lacking in original ideas. The production values, meanwhile, are excellent, from the music and the cinematography to the ambient atmosphere that is so palpably thick for the duration. The acting is also top notch throughout, with DiCaprio in snarling Billy Costigan mode from the Departed, leaving us wondering whatever happened to the vapid pretty boy he started his career pretending to be, and Kingsley looking menacing every time he appears on screen. However, despite these positives, the overall feeling one walks away from having seen this film is that it's contrived, by the numbers, and most definitely a case of style over substance. That being said, it's an enjoyable if not wholly satisfying ride, and certainly better than anything currently in the cinemas.